I am 46 years old, from Germany and ride usually a RC24 from 1989. I also drive now a Honda NC21 (and NC23). Finest thing from Japan in 1986! 34000km + excellent condition. I just love the sound of the gear driven cams. Looks great, I am jealous. Look forward to a video. we have a nice NC23 here too, haven't started it yet. Welcome to the asylum. That is a very cool machine. You obvioulsy have great taste in mc's. My buddy bought this last March from a dealer-guy with a big van and long trailer just full of exxxotic 400's lately shipped from England. Buddy got this NC super-cheap, since we don't know if it will run or not and no title, unfortunately. He also got his hands on these two sweethearts from a selection of late-80's CBR and VFR 400's. He's ridden the CBR a couple times but not the VFR, which isn't running at its best. 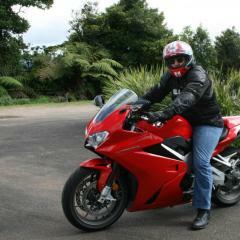 He really wanted this clean NC35 too but he was running short of $$$$, having bought a record 3 bikes in one day ! @squirrelman: Great collection! Especially the colours of your 400ccm-bikes are pretty much nicer than my NC21-grey/white and NC23-black ones. 😊 So the bike has a average usage of only 1000km/year on the road. I dismounted the main fairing for keeping it clean, safe and unbroken. So service is more easier too. Installed 2x EBC MD1006 front brake discs.